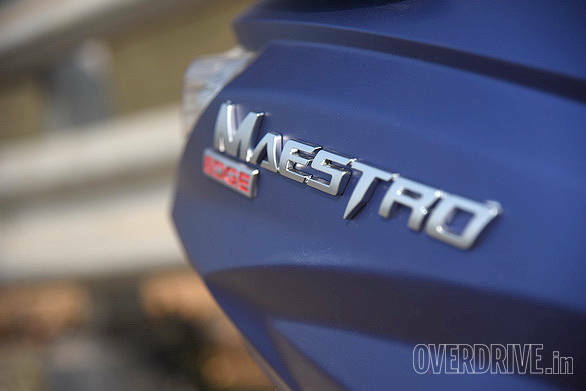 The Maestro Edge is Hero's first all-new product since its separation from Honda that has actually impressed me. They did make the new Karizma and the Extreme Sports, but valiant efforts as they were, there just wasn't enough meat in them to stand up and applaud. With the arrival of the Maestro Edge and the Duet though, Hero has just proven that they are heading in the right direction with their scooters. More importantly, they have just proven that their R&D department is on their way to coming up with some products that are quite impressive. 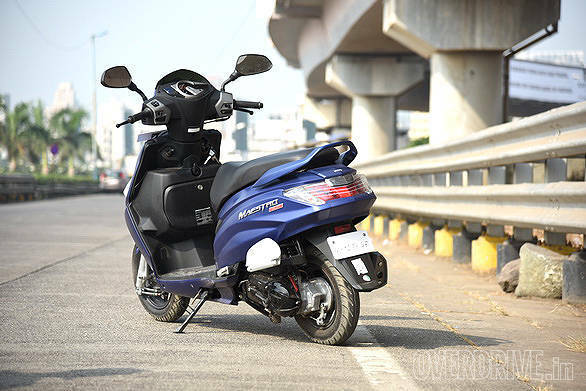 As far as styling goes, from among the two new scooter that Hero have made, the plastic bodied Maestro Edge is my pick. The test unit that we got came in a lovely Matte Blue colour that, aside from being a magnet for dust, is the best use of that colour since I last saw it on an Audi R8. The design is great too. It's got a fair amount of flair to it and the front end gets a dash of aggression thrown in with those little air intakes that look like flaring nostrils. The side profile too is quite handsome with some interesting lines on the side panels. The addition of the alloy wheels (12-inches up front and 10-inches at the rear, don't ask why) and the big exhaust in 'titanium' colour adds to this. I'm a huge fan of the rear though. That LED tail light cluster looks outstanding. It is unlike anything on any other scooter in the market and this makes the Hero stand out from the crowd. The finish levels are pretty good except for a few niggles. The cast foot pegs, for example, aren't very well finished and seemed to be something off a pre-production prototype rather than a scooter off the assembly line. What I did like though is that the Maestro Edge comes packed with features. It gets an ana-digi instrument cluster, a side stand indicator, service due indicator, an engine immobiliser, an external fuel filler, LED tail lamps, a little light inside the storage bay and even a USB 3.0 charging point for your electronic devices. Our test bike also came with the optional storage bay up front. 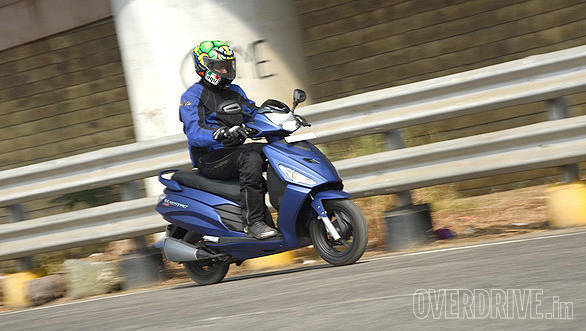 Being based on the all new scooter platform, the Edge uses a new 110.9cc motor that makes 8.4PS and 8.3Nm. The engine by itself is a peppy little number. It does 0-60kmph in 9.6 seconds and hit a top speed of 84kmph, even if it took a while to get there once I was past 70kmph. The motor doesn't feel unrefined in any way even when you're trying to squeeze every bit of performance out of it. But as tolerant as it is to shenanigans, it is happiest doing the city run-around. When you're zipping in and out of traffic and rushing away at green lights, the engine performs flawlessly. It is economical too. 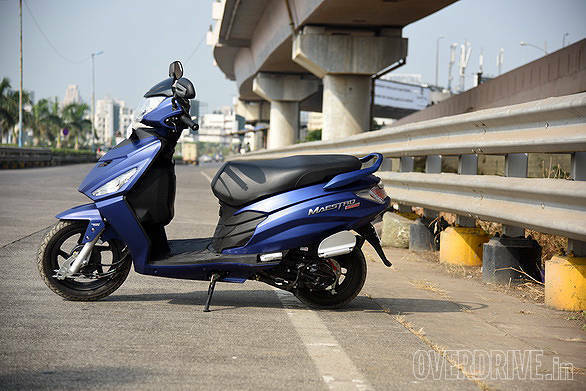 Hero claims an efficiency of 65.8kmpl. As all manufacturer claims, this too is on the higher end of the spectrum. In our city test run, we managed to clock 49.3kmpl while we managed 58.2kmpl on the highway. This leads to an overall efficiency of 51.5kmpl. Both the new scooters  the Edge and the Duet are based on a completely new platform. This means that the Edge uses a new frame. Details are still scant about what exactly went into the making of the frame but we do know that the steering geometry was fiddled with. But whatever it is that Hero have done, it works. The scooter handles really well and you can really chuck it into corners. In fact, if you find the space and inclination, you can corner it hard enough it scrape the 'titanium' bits in the road. A lot of it has to do with the way the suspension is set up. 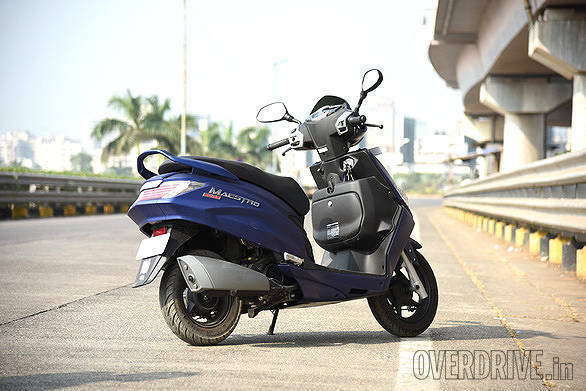 The Maestro uses a telescopic fork up front and a hydraulic shock at the rear. The way both the front and rear units work is excellent. The scooter has ride quality that rivals almost every other scooter that I remember riding. It can take bad roads all day long without causing the rider any back pain. It is superbly damped and just soaks up everything in its way. And according to me, the rear suspension is among the very few units on scooters that works really well. 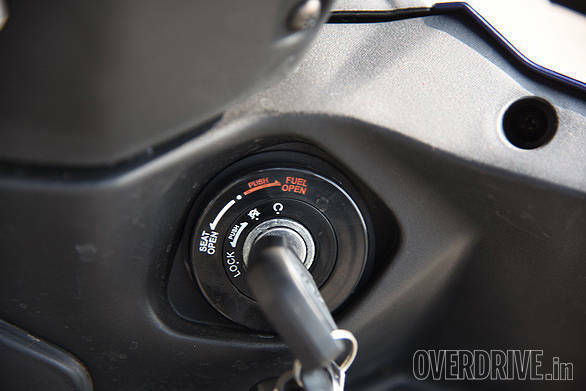 In the 110cc scooter segment, there isn't exactly a lack of options. With every single manufacturer having an offering, it is a heavily contested segment. So, to stand out in a crowded marketplace, the Maestro had to bring a lot to the table. With its smart design, impressive list of features, reasonably efficient and powerful engine and outstanding ride quality, it seems to have brought everything that the others do and then some. 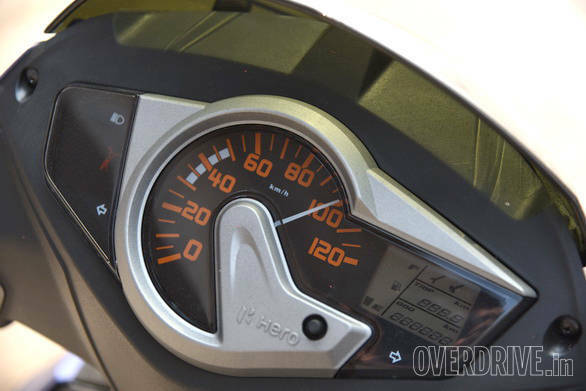 At Rs 51,502 (ex-Mumbai) for the top end variant, it isn't all that expensive either. This places the Hero somewhere around the top of the 110cc scooter pyramid. But more importantly, what this says about Hero is that they seem to have finally got their R&D together. And judging by how impressive their two new scooters are, I can't wait to find out what the next motorcycle will be like.